Noisecreep put this video in their top 10 videos of 2013.
t’s important to remember that videos are here to entertain, and with that in mind Zakk Wylde and his Black Label Society likely registered many a smile with their clip for their cover of the typically heart wrenching Bill Withers classic, ‘Ain’t No Sunshine.’ As the camera pans up on Wylde playing the opening notes of the track, we see that he has a horse head. In fact, all of the characters in the clip are a hybrid of humans and animals, with Wylde’s titular horse imagining a dream life with a unicorn. 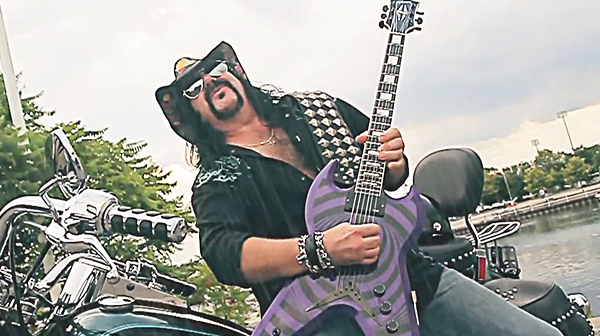 Add in an odd Vinnie Paul cameo (on guitar no less) and ‘Ain’t No Sunshine’ is one of the year’s most bizarre (in a good way) and best music videos of 2013. Click here to see the other videos that made the list. R.I.P. Bill Sitkiewicz 1957 – 2013.